The program includes original compositions by Alex and myself, as well as some fairly varied "cover" repertoire. It's my final recital as an undergrad (though not a graded final recital as is the norm in many programs), and it's bound to be a special event. So many things on the go right now. I just spent most of this week - which has ostensibly been my "break" - playing on McGill jazz auditions. I've done it every year (with, perhaps, the exception of my freshman year), and while it's a blast to hear the new blood, it makes for very long days. By the end of it, I generally never want to hear "Body and Soul" ever again. The free refreshments in the welcome centre make up for it. I'm infatuated with the idea of attempting an application for the BMI Jazz Composers Workshop. I'm still not definitively sure on how large ensemble writing or New York City fit into the rest of my life, but it seems like as good of a test balloon as any. So now, that entails rounding up a big band to record the demo disc, and finishing new big band works. Luckily the assignment for Advanced Arranging right now is a big band chart, and I have a sketch for another piece which seems to lend itself to a larger ensemble of some form or other. And it turns out that the grant application deadline is - as is always the case - far too close for comfort. Next Thursday, March 2, is Indigone Trio + Strings in Clara Hall at McGill. I am very, very psyched for this. I remember Chris Smith telling us in Basic Arranging about the profundity of hearing strings play your music for the first time. The whole recital was borne out of indecisiveness and general half-baked, hare-brainedness (I suppose any musical decision worth making is a product of absurdity in some way), but I'm lucky to have found kindred spirits who are willing to go down this path with me. March 3, Kweku & The Movement hit at Café Campus. We're on a bill with The Dust Jackets and God Made Me Funky. Not sure of the band order, but it promises to be quite the show. March 11, I'm playing in a free improv master class run by violinist Malcolm Goldstein. I'll be playing with trumpeter Gordon Allen, trombonist Paul Tarussov, and bass clarinetist Guillaume Bourque. We all went to Banff together but this will be the first time all four of us have played in one ensemble. It's in Clara Hall, again, from 2-4 pm. As for other people's gigs: Last night I saw Quinsin Nachoff with Mark Helias, Jim Black and a string quartet of Québécois, playing all of Quinsin's originals. Quinsin's sounding fantastic on tenor and soprano, with great control of both horns, and a fantastic altissimo on the tenor that reminded me at times of Michael Blake. It was great to see Jim Black live, finally - the drum solo he unleashed on the last tune was a marvel of colour and gadgetry. He was pulling out various percussion accessories that hadn't made appearances in the concert previously, seemingly materializing out of thin air. Helias had some phenomenal bass solos on the second set. The strings and trio were tight together, in terms of Jim and Mark catching all the punches and playing dynamically, but I found the writing to be busy for my tastes, and I wanted to hear a little bit more of uninterrupted trio playing. "Whorls," for sax and strings, as well as the aforementioned concluding piece, loaded with trio and solo improvisations, were the most effective use of musical resources of the night. Tempo di "bounce, les gros!" It seems that amid all the "Montreal-is-the-new-Seattle" pants-wetting (thank you, Arcade Fire) that happened last year, domestic and foreign press systematically overlooked a lot of the developments in the Francophone music scene, which has produced some very impressive groups in my estimation. Additionally, there is a fairly thriving "new music" scene here in Quebec, with the SMCQ, the music programs of McGill, Concordia, UdeM and the Conservatoire de Montreal. And, apparently, they've commingled. Le Consort Contemporain de Québec, led by 25 year old Nicolas Jobin, has gotten his feet wet in the Francophone festival scene - reinterpreting the music of Québecois vedettes through the lens of new music. First it was chansonnier Pierre Lapointe, and here is the CCQ's collaboration with sovereignist hip-hoppers Loco Locass. As a purely social statement/experiment, it's interesting. Musically it's not half-bad, either - an intriguing take on hip-hop, to be sure (percussion is of the pitched variety more often than not). I've always liked the flow of the MCs in Loco Locass. The video lacks audience shots - I wonder how many of the people at that concert were CCQ followers or new music devotees in general, how many were Loco Locass fans, and how much investigation of the other music occurred after the fact. With all the recent blogging on collisions and the reclamation of new music by bands like Alarm Will Sound and Eighth Blackbird, this seems like as worthy an entry as any. Back on the 10th, Kweku & The Movement opened for Throwback at a just-opened venue called Le National Music Hall. It's a converted theatre - it used to be used for television filmings, but now the management of Cabaret Music Hall/La Tulipe have taken it over. In fact, Cabaret Music Hall doesn't exist anymore - it's all moved to Le National. Reminiscent of Toronto's The Opera House, it has a big stage and balcony. It differs with a very sloped floor. Gig-wise, we played well (save a couple of miscommunication flubs) and had fun. I'll give the sound guys and techs the benefit of the doubt because they're all new. But it was strange - I had what may have been the best monitor mix I've yet to encounter in a rock club, yet the keyboards weren't coming through out front. The bassist could barely hear the drummer, even though they were standing beside each other. As a friend commented later, inebriated patrons shouldn't be doing a paid employee's job better than they are - i.e. our friends shouldn't be correcting the sound men on the mix. I'm just convinced that sound guys don't know how to deal with keyboards anymore. Up next for The Movement: March 3 at Cafe Campus. Details to come. Had the first rehearsal for the Indigone Trio + Strings recital last night. We're doing 6 of my arrangements and 2 by Alex. All I have to say is wow. I don't want to let cats out of the bag prematurely but this is proving to be the best recital I have put together yet. We started the rehearsal with an arrangement that I sort of rushed and wasn't completely sold on, and by the end of it I had shivers. Alex and I are complementary composers; our styles differ (sometimes fairly drastically) but they really work together. His two originals are really stunning. I am incredibly privileged to have the opportunity to work with such wonderful, open and creative musicians. 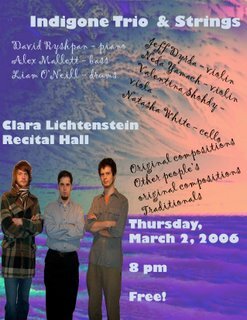 The concert is March 2, 2006, in Clara Lichtenstein Recital Hall. 8 pm. Free. Kweku & The Movement (in which I play keyboards) are opening for Throwback (Montreal funky-folk-rock, see today's Montreal Gazette for profile) TOMORROW NIGHT! Friday, February 10, 2006 at a new club called Le National Music Hall (1220 Ste. Catherine E., metro Beaudry). Tickets are available in advance for $10 through me, or $12 at the door. We hit at 9 pm. The Movement is: Kweku Kwofie - vox/keys; Akua Carson & Katie Hampton - vox; Mikael Tobias - guitar; yours truly - keys; Anna Ruddick - electric bass; Mark Nelson - drums. I got involved with CKUT and Jazz Euphorium at the beginning of 2004, slowly immersing myself in the world of collective college/community radio. It's proven to be a treasure trove of opportunity, as I've had the occasion to interview and meet many fabulous musicians (whom, as a musician myself, I view more as a colleague than as an interview subject), work with fantastically knowledgeable co-hosts, and explore music I'd otherwise never have access to or never think to listen to. The CKUT library is an incredible resource, receiving new releases all the time, as well as having a huge archive of lesser-known recordings. Case in point: in preparing the AACM feature last night (check the JE blog for the playlist and more information), I went rummaging through the Anthony Braxton collection, which is fairly extensive. I came across a disc entitled Creative Orchestra Music 1976 (Arista). I put it on for preview, and the first track impressed me for its intricate, irreverent melody and rhythmic drive. As we aired the piece, I started leafing through the liner notes, and the motley crew of personnel floored me: a trumpet section made up of Cecil Bridgewater, Kenny Wheeler, Jon Faddis, and Leo Smith; George Lewis on trombone; Dave Holland on bass; Muhal Richard Abrams on piano. Elsewhere on the album, Roscoe Mitchell joins the reed section, Frederick (sic) Rzewski appears on piano (often alongside Muhal) and percussion, and Barry Altschul is behind the drum set. I am definitely going to have to track down this album. Other discoveries included the Air record 80° Below '82 (Antilles), which John Corbett once trumpeted in his "Vinyl Freak" Down Beat column, and Kahil El'Zabar's Ritual Trio which my co-host Natalie brought along.